Nurse George Bullard has a ready reply when patients at Munson Medical Center tell him fear of falling makes them reluctant to get out of bed and move around, a standard pre-release recommendation. “ ‘You’re a piece of cake. 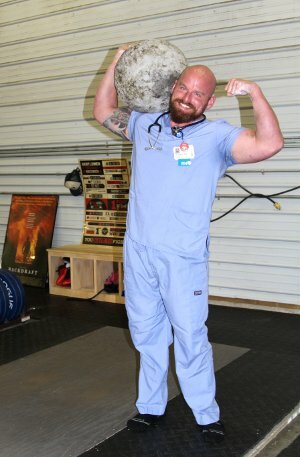 You’re not going to fall,’ ” said Bullard, a 2013 graduate of NMC’s nursing program and, most recently, qualifier for 2017 U.S. Strongman national competition. The muscles and tattoos beneath Bullard’s scrubs initially belie his profession. But he says patients love hearing stories and seeing pictures of his competitive weightlifting life outside the hospital. And their roads to recovery and his own in the gym actually run parallel. “It’s all about achieving goals,” said Bullard, 30. Patients have the goal of getting better, and he helps them achieve it. In doing so Bullard earned an achievement himself earlier this year, winning the Daisy Award, a national award for nurses who provide extraordinary, compassionate and skilled care. At Munson Bullard is also a preceptor — teacher — for both nursing students and newly hired nurses. They shadow him to get a better understanding of how the general medical floor works. “The biggest thing we have to teach them is how to advocate for the patients,” he said. In the case for which he received the Daisy Award, Bullard argued against a physician’s discharge recommendation, believing the patient wasn’t strong enough yet. The doctor agreed to a walk test. The patient didn’t fall, but did become short of breath and his oxygen level dropped. Subsequent tests revealed two liters of fluid on the man’s lung. Had he been released, Bullard said, he could have drowned. Bullard’s floor at Munson sees the most patients with the most varied conditions of the entire hospital. He says his NMC education equipped him well for the challenge. “I had such a variety when I was a student. I was confident when I got there,” said Bullard, a Flint native who was drawn to a nursing career after moving up north to take care of his aging grandmother. Next year, in addition to training for the national strongman competition, Bullard plans to advance his career by enrolling in Ferris State University’s BSN program at the University Center. He ultimately hopes to become a nurse practitioner. “I’m a nurse. I love it,” he said.